Ah, Christmas. That magical time of year. A time for family and gatherings. For presents and fun. So why shouldn’t your dog get a piece of the action? 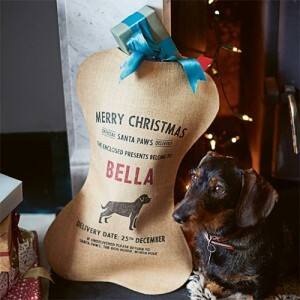 We’ve compiled a list of the top 10 lovely and unusual Christmas gifts for your dog from Not On The High Street. So why not treat them to something extra special this Christmas in return for all that unconditional love they’ve shown you for the last 12 months? 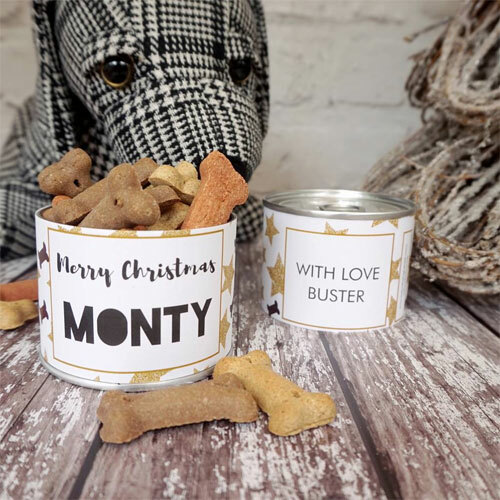 These alternative Christmas crackers for pets are personalised with your dogs name, and a personalised message on the back. 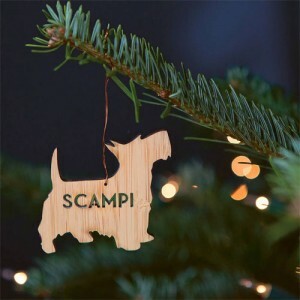 Perfect for the family to show their dog just how much it’s loved at Christmas time. Matching crackers for the humans are also available. 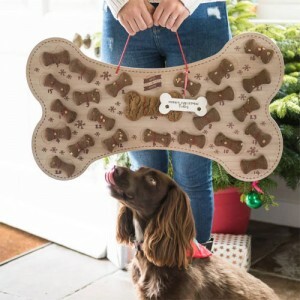 Filled with delicious biscuit bones, your dog is sure to love his or her treat at Christmas time. Choose from over 80 different dog breeds, or even request a bespoke shape. All designs can be personalised with your pets name. Each dog lead hook is precision cut to order, and hand finished. Add a white ceramic keepsake personalised bone decoration to your wreath , it will be perfect to hang on the tree once the biscuits have all been eaten ! 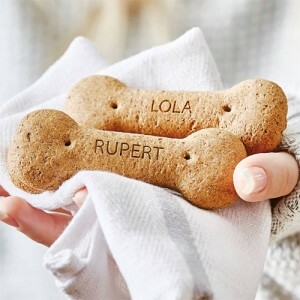 These bone shaped treats are carefully engraved with your dog’s name, such a sweet gift for them to enjoy this Christmas. Sure to get their tail wagging, our Personalised Dog Treats help to make your dog feel special. 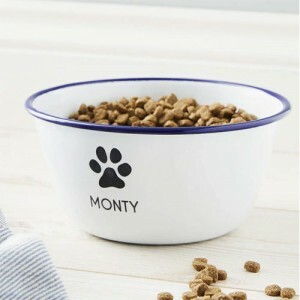 Serve your pets food in style with these classic enamel personalised pet bowls. A wonderful, stylish pet bowl that’s customised with your pet’s name. Perfect for dogs of all sizes! Featuring our puppy paw design. 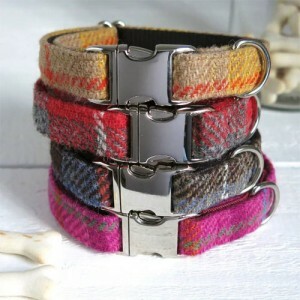 A handmade Furry Necks Harris Tweed collar is a fabulous treat for your dog. 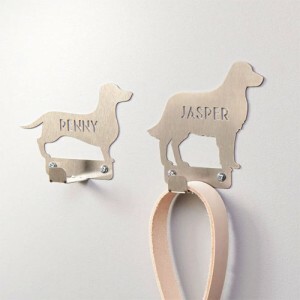 They make a great addition to any dog’s wardrobe and will really make them stand out from the pack. Each collar is carefully handmade to order just for your dog and has been carefully designed to be durable, practical and also luxurious, great for every day or the poshest of occasions. If the four legged friend in your life takes pride in his appearance and appreciates the finer things in life then he’ll love this tag! 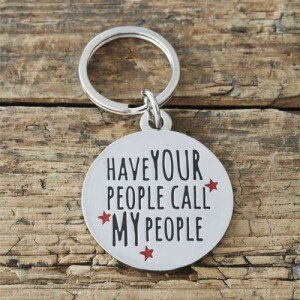 The tags are made from silver plated brass and can be engraved with up to 48 characters. 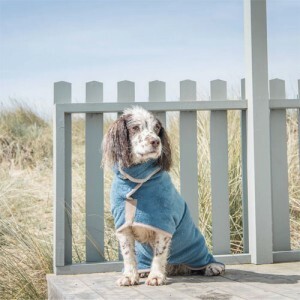 Ruff and Tumble drying coats are a must for all dog owners. Simple to put on and take off these coats wick away dirt and moisture and leave you with a clean and dry dog in under 45minutes! So there you have it. Our top 10 Christmas gifts for your favourite person!